The beta test of Overwatch has exceptionally good works for Blizzard – it was more successful than that of The Division and Destiny. The publishers and developers report that more than 9.7 million players in more than 190 countries have played the beta phase of the game up to today. In this guide we show you general tips on server launch and show you how you can start playing Overwatch. 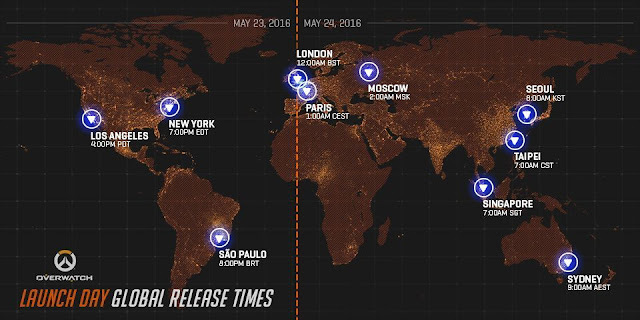 In the graph below you can see the server launch time in all countries. In order to play Overwatch, you need the official Battle.net desktop app. You have to download and installed it. Below you'll find the system requirements for Overwatch and check whether your PC is capable to run the game. Blizzard has provided the instructions on how to download and install Overwatch on all available platforms. - Open the downloaded Battle.net app. - Log in now with your account or create a new, free account. - Now automatic updates should follow. - Do you have an Overwatch CD with key then you have to do nothing when downloading. - Now click on the Overwatch icon and select your region. - Install / or update (if you have it already installed) will start now. - Click play to start the game. - If you own a physical copy of Overwatch, just insert the CD and follow the instructions. - If you have to download it to your PS4, just turn it on and log in. Now, the automatic updates should load the game. - If the automatic update is turned off, then you have to manually download it from the store. - With a physical copy you don’t have much to do: Insert the CD and follow the instructions. - If you have a download version, then start your console and log into Xbox Live. - If the instant power mode is turned on, the game automatically downloads. - Under your games find Overwatch. Then select to install.